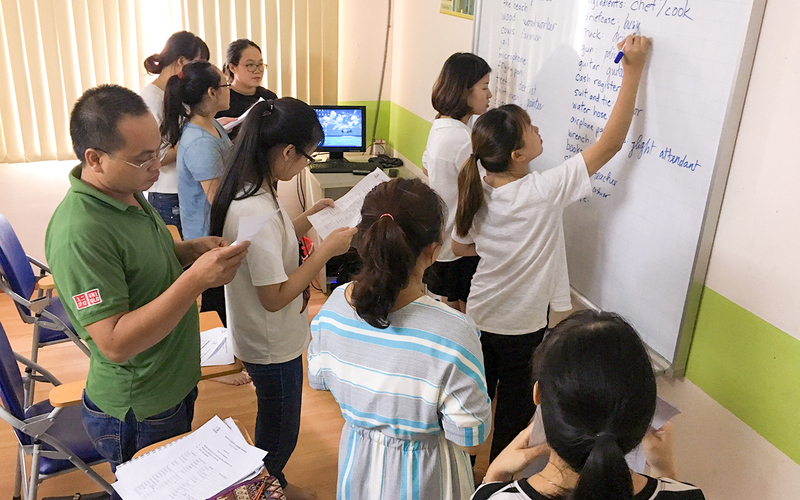 We’re wrapping up our second week of teaching here in Vietnam with The Mercury Center. I think it’s fair to say that the actual teaching part has been very challenging but one of the most rewarding aspects of our time here so far. That will not be the last of that particular sentiment you’ll hear on this Becker Workaway Adventure, I am certain. For me, teaching was very difficult at first—still is in many ways, but confidence is growing each day. I just happened to be the first one in our family to take on some classes last week, and with no idea what to expect nor the benefit of actually being a teacher myself, it was tough. I think things went pretty well…I think…? ?…hard to tell, really. Those first few classes I had to keep reminding myself that I’m only here to be as helpful as I can. I am the “teacher” they have at this moment, I’m the current link in that very long chain, and all I can do is the best I can to be helpful and provide opportunities to practice and improve. Once I let go of thinking I had to perform a certain way or do a certain thing, I think I was able to overcome some of that very strong Impostor Syndrome and just settle in to the whole thing. This week, most classes have been good. I am able to enter with an attitude of positivity, the feeling that I’m just heading to class to hang out with new friends and practice English and share a little of my life. That has helped me feel a thousand percent more comfortable. Now the typical routine is that I go into class feeling unprepared and nervous but leave thinking it was fun and things went great. My classes are conveniently located on the 20th floor of the same building where we are staying (our apartment is on the 26th floor). So unlike Maureen and Aubrey, I don’t get to take bus or motorbike rides to go teach, which has its plusses and minuses. 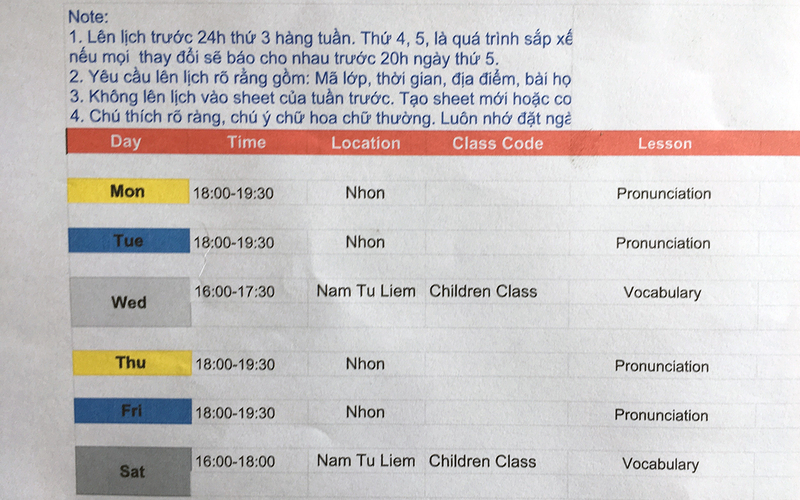 I teach four different groups, one or two classes per day. 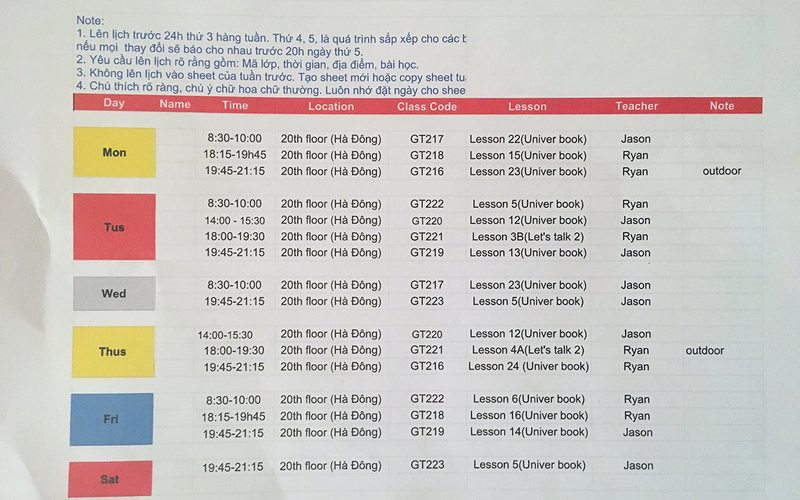 My two classrooms are small with a whiteboard and a marginally-operational “aircon” (air conditioner). We are working from a book that these students have been going through—they sign up for a 30+ lesson course that takes them around four months to complete. 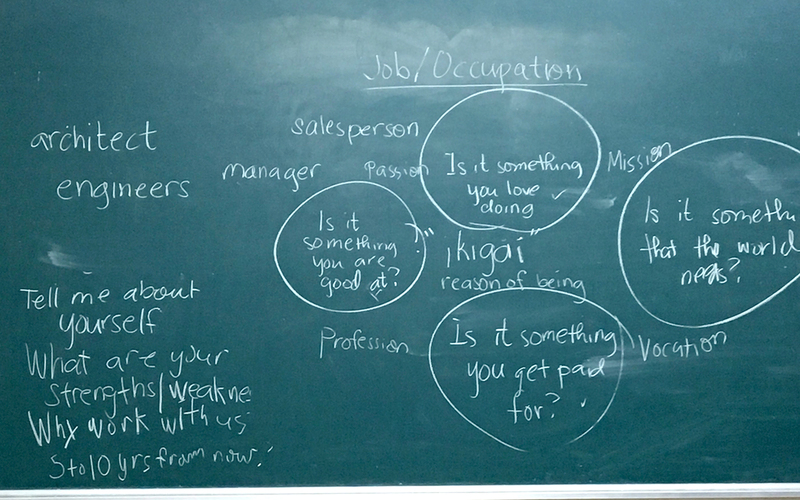 So in each session we’ll have a topic like Days, Dates & Months, or Shopping, or Ordering in a Restaurant—topics you’d imagine one would go through in an ESL class. The majority of students are university students in their early- to mid-twenties with a few exceptions on both sides of the age bracket (a few teens, a few thirty-somethings). 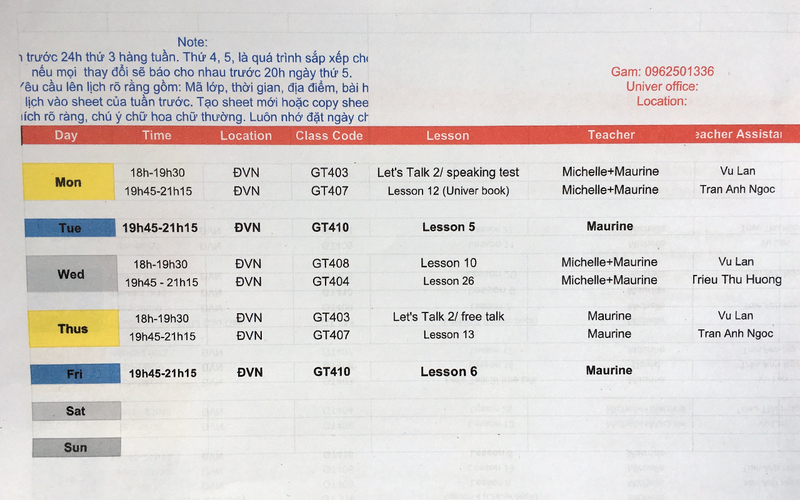 In each class, I have a teaching assistant that helps me prepare lessons and attends class to just facilitate everything and translate when necessary (as little as possible). These assistants are very, very helpful and it really wouldn’t work at all without them. But all of this so far is just reporting the news. The real thing to know about this entire experience, the stars of this show for all of us, are the STUDENTS, who are for the most part ABSOLUTELY WONDERFUL. They’re eager to learn, mostly eager to try, and (thank goodness) pretty forgiving with us so-called English teachers. Their attitude very quickly makes you want to do your very best for them. We have fun banter back-and-forth in just about every class, and there is always always always lots of smiles and positive energy. 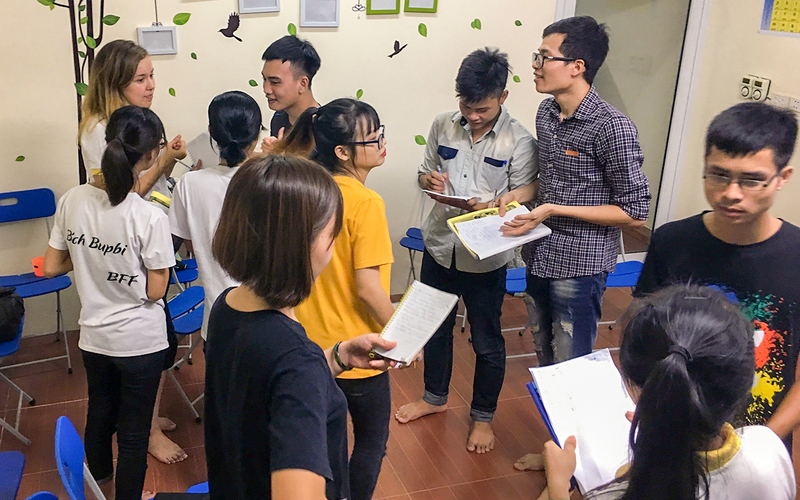 The students are inquisitive and enjoying hearing what we think about Vietnam, and I think they enjoy hearing me tell stories about what things are like in my life in the US. 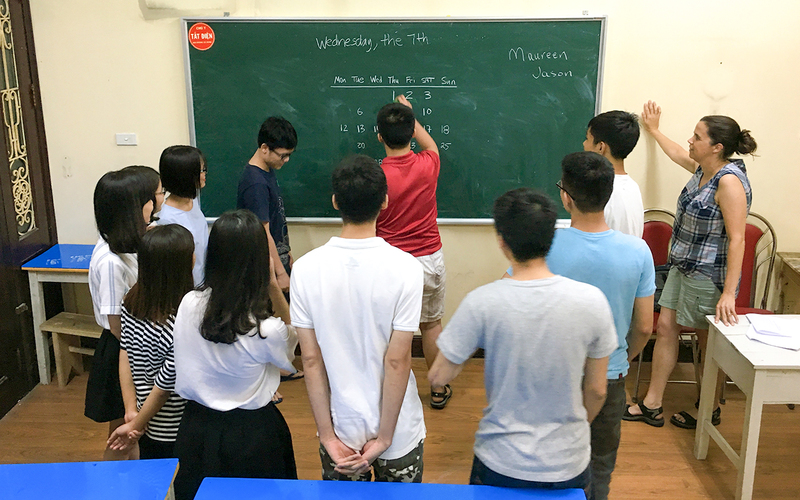 Some of the students are actually quite skilled at speaking English, and some struggle mightily—a range you’d expect. We’ve had invitations from students to go play basketball, to play soccer, to go camping, to have a beer. Sadly nothing has worked out just yet, but I’m definitely seeking opportunities to say “yes” when they come up next. In short, I am really enjoying these guys. Depending on everyone’s schedule and what’s going on and where, Maureen and I will bring Aidan or Maya along to our classes and have them help us with whatever parts seem appropriate. They are welcome to join us anytime; we don’t have to ask permission or make any special arrangements. It’s been fun to have them with me in class. We’ll do Team Jason vs. Team Maya games, or I’ll have Aidan speak half of the vocabulary pronunciation practice, stuff like that. When we role-play or have partner speaking practice, they can jump in and participate. Maureen’s classes are held at a different location a short bus ride or Uber away. Similar setup, (nicer room I must say), and going through the same book I am. 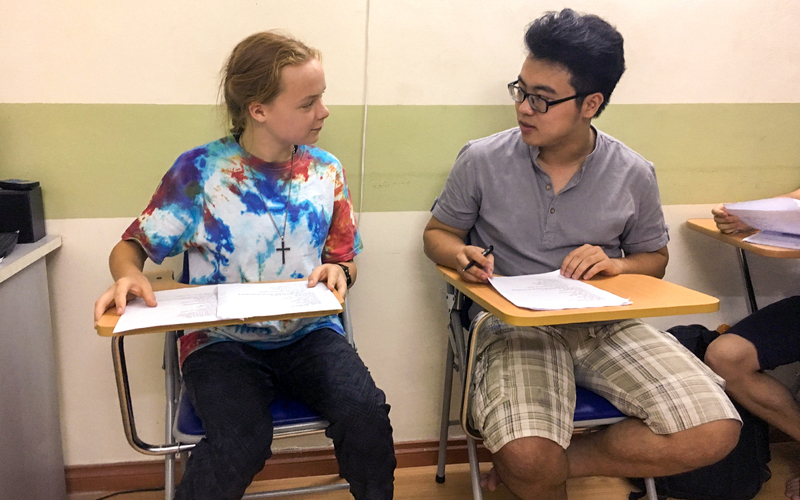 Maureen has two different classes and until now has been doing a little co-teaching with our fellow volunteer Mechele, but now has her own full schedule. It’s usually an Uber ride back to the apartment after an evening class ends at 915pm. And then there’s Aubrey. 🙂 Aubrey is teaching in two locations by herself, one class per night—in one location she has two groups of university-age students and in the other a rambunctious group of ten- to twelve year olds. 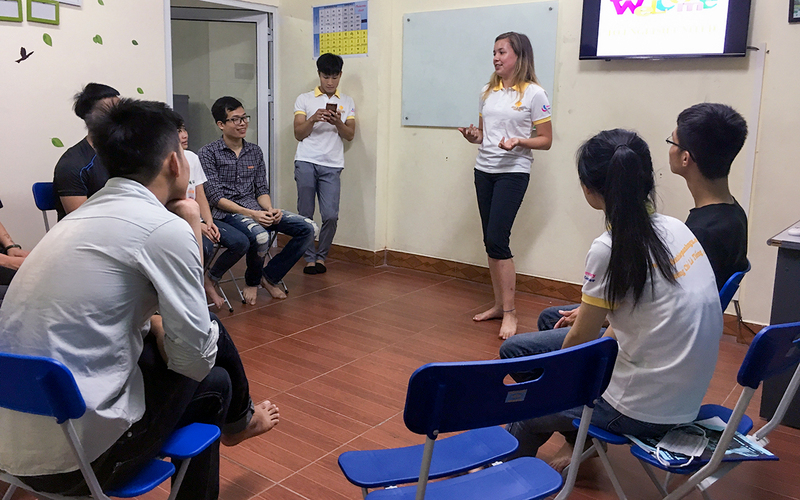 She is driven to class by other volunteers here on the back of a motorbike—Aubrey has logged the most time braving the crazy streets of Hanoi! I accompanied Aubrey to her first university-level solo class—Dad here just wanted to get eyes on where my daughter would be and who she’d be with, eighteen-year-old-“adult” be darned—and I’d definitely describe it as more of an English “Club” then the more traditional classes Maureen and I are involved with. They are crazy, young, fun, happy, and oh do they LOOOOOOOVE Aubrey. She comes back from class full of life, and that’s always the best barometer of how things are going. We’ll get next week’s schedule on Sunday night—oughta be similar to this week, I’d imagine. More soon!